By Robert Allen. 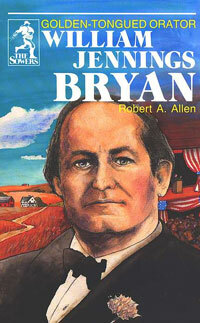 A great Christian and a great American, William Jennings Bryan left an indelible mark upon America and the world. He was called the golden-tongued orator yet he was known as the Great Commoner, fighting for the common people against the power of big corporations and monopolies, fighting against evils in society and government. As a schoolboy, Bryan would practice making speeches in the fields and woods, speaking with pebbles in his mouth as he heard Demosthenes of ancient Greece had done, planning all year for the speaking contests that were coming. While still a youth, he determined to emulate Cicero and use what eloquence and power he might attain, not for himself, but for those who were oppressed. And throughout his life he held to that decision. For ages 9 to 13.